"If you ever get a second chance in life, you've got to go all the way." The cyclist with the current fastest time during the Tour wears cycling's most coveted symbol: the yellow jersey, or, in French, le maillot jaune. 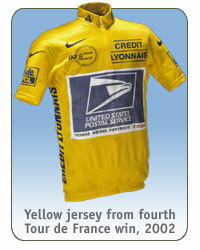 Wearing the yellow jersey for a leg of the Tour is the highlight of most cyclists' careers. Armstrong has worn the yellow jersey more than 60 times, spawning his nickname, "Mellow Johnny," a play on the Texas pronunciation of the French words. Lance Armstrong proved that life-threatening illness can be a beginning, not an end. His victories destroyed overwhelming physical and psychological obstacles, clearing a path for others to follow. At age 25, Armstrong seemed invincible. World Championships, Tour DuPont victories, a #1 world ranking, and a spot on the U.S. Olympic Team secured his name in cycling's history books. Excruciating pain forced Armstrong off his bike in 1996. He was diagnosed with advanced testicular cancer, and his prognosis looked grim. But Armstrong declared himself a cancer survivor, not a victim. During his treatment he established the Lance Armstrong Foundation to promote cancer education, advocacy, public health programs, and research. In 1998, Armstrong celebrated his victory over cancer by winning the Sprint 56K Criterium in Austin, Texas. Since then, Armstrong has turned the world of cycling upside-down. Armstrong entered and won the arduous Tour de France in 1999. In 2004, he won the race an unprecedented sixth consecutive time, a feat accomplished by no other rider since the Tour's debut in 1903. Lance Armstrong: The Race of His Life. On the Bike with . . . Lance Armstrong. "A&E Biography: Lance Armstrong - Racing for His Life"